NASA’s Orion space capsule that is set to get humans to Mars is about to make its maiden flight. Orion will be launched on a Delta rocket out of Cape Canaveral in Florida on a short journey above the Earth to test key technologies. The conical vessel is reminiscent of the Apollo command ships that took men to the Moon in the 1960s and 1970s, but bigger and with cutting-edge systems. Given that this is a first outing, there will be no people aboard. Nonetheless, the NASA describes the demonstration as a major event. 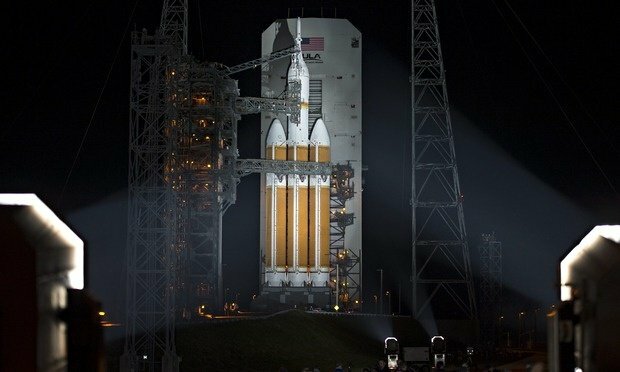 NASA has a window in which to launch Orion of about two-and-a-half hours, which began at 07:05 local time. The launch preparations had to be stopped shortly before the opening of the window because a boat strayed into the eastern part of the launch range. After that, the countdown had to be held because of strong winds and a technical issue. Orion is being developed alongside a powerful new rocket that will have its own debut in 2017 or 2018. Together, they will form the core capabilities needed to send humans beyond the International Space Station to destinations such as the Red Planet. For Thursday’s flight, the Delta IV-Heavy rocket – currently the beefiest launcher in the world – is being used as a stand-in. It will send Orion twice around the globe, throwing the ship up to an altitude of almost 3,600 miles. This will set up a fast fall back to Earth, with a re-entry speed into the atmosphere close to 20,000mph – near what would be expected of a capsule coming back from the Moon. It should give engineers the opportunity to check the performance of Orion’s critical heat shield, which is likely to experience temperatures in excess of 4,000F. They will also watch how the parachutes deploy as they gently lower the capsule into Pacific waters off Mexico’s Baja California Peninsula.